If it Leaks, if it's Plugged, or Just Flat Out Doesn't Work, Call Us & We'll Fix it. With our state-of-the-art technology, we are able to go into your sewer lines and detect any issues that may arise before you purchase a home! Call us today for more information! Get to the ROOT of the problem and give us a call! Having issues with sewer, water, irrigation? 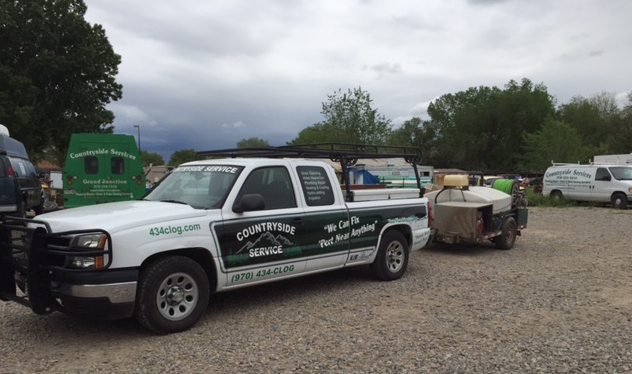 Call (970) 434-CLOG, Countryside Service Inc has you covered! Let us put our expert handyman team with a combined 50+ years of experience to work for you. We understand the frustration of plumbing issues, and we pride ourselves on taking care of our customers to give them peace of mind. We also take pride in the fact that we charge you the SAME PRICE* no matter what day you need us. Pipes don’t wait for the “work week,” and neither do we! This is just one way that Countryside Service Inc cares. We have operated in the Grand Junction area for over 12 years, and we truly enjoy helping our beautiful community. Put your trust in Countryside Service Inc. the next time you need a plumber. As we like to say, “We can fix pert’ near anything”! We would love to hear from you! Please fill out this form and we will get in touch with you shortly. For service inquires, check out our rates page. Please let us know if you'd like us to reach you via phone or email! This a picture of a broken toilet drop. All of the waste from this toilet was going directly into the crawl space for about 2 months. If this family had purchased flood stop it would have sounded an alarm to alert them of the liquid in their crawl space. ©2019 Countryside Service Inc, all rights reserved.